Arrived safe and sound in South Korea last Wednesday night, the 22nd of December. The flight was perfect. Smooth the whole way... long enough time to be on a plane all the same though and it was great to get off and be able to walk around the airport properly.Had our first encounter of Korean cuisine on the flight. We had a thing called bi-bim-bap which I had already read about, basically you mix veg with rice and a spicy red pepper paste.. it was nice but kinda cold though I imagine in "real life" it'll be much nicer. After falling into bed and sleeping soundly I had my first day teaching then on Thursday.. still quiet tired but everything was so new we didn't really get the chance to notice how tired we were. The school itself was so impressive driving in even at night the buildings are class looking. Dee and I are sharing an apartment.. its perfect, kitchen, living room, bathroom and 2 bedrooms. Its clean and nice and sure thats all we need. We met the school education director that morning and a few more people then I was brought to the kindergarten school and Dee to the elementary. I am teaching the 7 year olds (so the are about 5-6 in irish years) there are 8 students in my class. The first day flew by and Thursday night I fell into bed again...wrecked!! 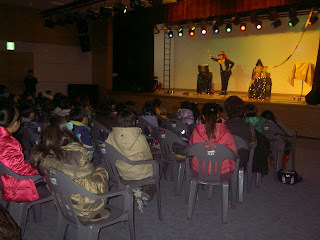 On Friday we had a Christmas party for the kids with a magician. All the kids loved it and I'll admit I was impressed myself at times! :) After the magician Santa arrived!! So cute watching the kids get so excited over their presents. The school is lovely, the classrooms are so bright and colourful. At the moment my students are learning Rudolph the red nosed reindeer, it's so cute. Also we are putting on a talent show in Feb and they will be doing a little play of the ugly duckling so we will be starting rehearsing for that soon. Our school is about 30-40 mins walk return (5mins drive) from the closest village and on the subway we are just over an hour for Seoul. There is a big beautiful Christmas tree in the courtyard outside our apartment, it looked so pretty on the first night with the lights when we arrived. I have lunch from 11.30-12.30 everyday with the students. Lunch is Korean food.. I try a bit of everything and it is yummy for the most part. I had difficulty using the chopsticks at first so lunch on Thursday and Friday was eaten with just a spoon!! :)Then on Friday night a we went out with a group of other foreign teachers (ex-pats) here who successfully showed me how to use the chopsticks and I am very proud to say I have now eaten three meals using only chopsticks!! 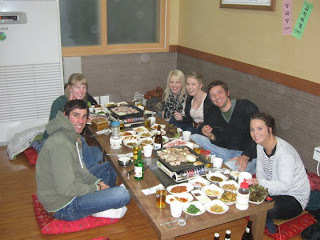 We then went to a Haf house after for beer and soju (the Korean drink). A really fun night was had plenty of laughs and I will agree that the soju is a lot stronger than it tastes, a very good Christmas eve!Drink is so cheap here too.. all in all a lot of fun nights ahead I'm sure. Yesterday was Christmas day and so we chilled in the morning, then went to the local village of Yongmun which was a lot bigger than we assumed and we bought a few bits and pieces for the apartment. Last night we met with another group of ex-pats in Yangpyeong, a bigger town 2 subway stops away and had a traditional Korean meal. Basically they bring lots of side dishes to the table such as rice and veg and salad and then a plate of raw meat which you cook on a grill in the centre of the table yourself. It was so good, the meat was really tender and tasty... has to be the most unusual Christmas dinner I've ever eaten though. Ireland and its turkey and ham dinner seemed so far away as we sat cross legged on cushions on the heated floor around a low table. So far Korea is a turning out to be a wonderful country with such friendly people.. I cant wait to see what else the future will bring here!